Friendship is one of life's most essential and rewarding forms of interaction. It is a feature of every culture and most persons interact with their friends on a daily basis.This book provides a forum in which a group of internationally recognized scholars, active in the study of friendship, presents the major conceptual issues, themes, and findings from their research. The authors describe the theoretical and empirical context, and the goals of their own research programmes. They discuss research and the methodological strategies adopted for studying friendship relations. 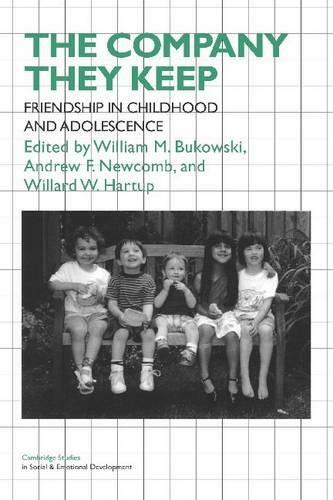 A variety of topics is explored, including cultural variations in children's and adolescents' friendships, the association between friendship and cognitive and personality development, the effect of friendship on adjustment, and the links between experience within the family and relationships with friends. This book will appeal to developmental psychologists, researchers, and students. It will also provide a solid reference work for social psychologists, sociologists, and social workers concerned with interpersonal relationships.